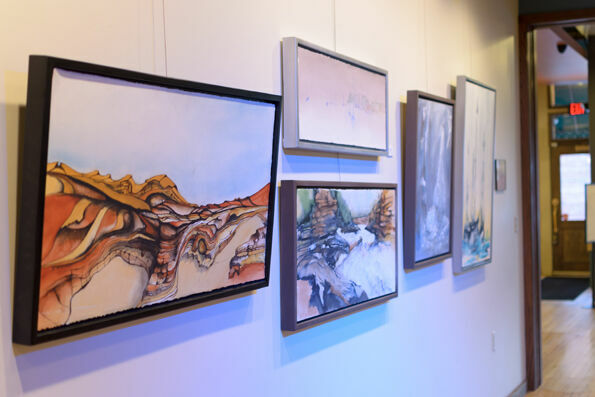 This collective show features artwork from members of the Chippewa Valley Watercolor Artists group, showcasing techniques that range from traditional watercolor, to experimental and mixed media. These area artists bring different backgrounds and varied levels of expertise to their work. Whether the subject matter is observational, emotive, or abstract, this show will provide a delightful mix of work for the viewer to enjoy. The Chippewa Valley Watercolor Artists began as an inspired group of students from Janet Carson’s watercolor classes who wanted to continue to meet and learn about the possibilities of the media. The group has been meeting at the Beaver Creek Reserve since November 1993, with their first show being held in 1994. Now in their 25th year, the artists continue to meet to paint, discuss their work, and share fresh ideas with long-standing members as well as those new to the group.